2 The General Assembly. All UN Member States are represented. Each member has ONE vote. 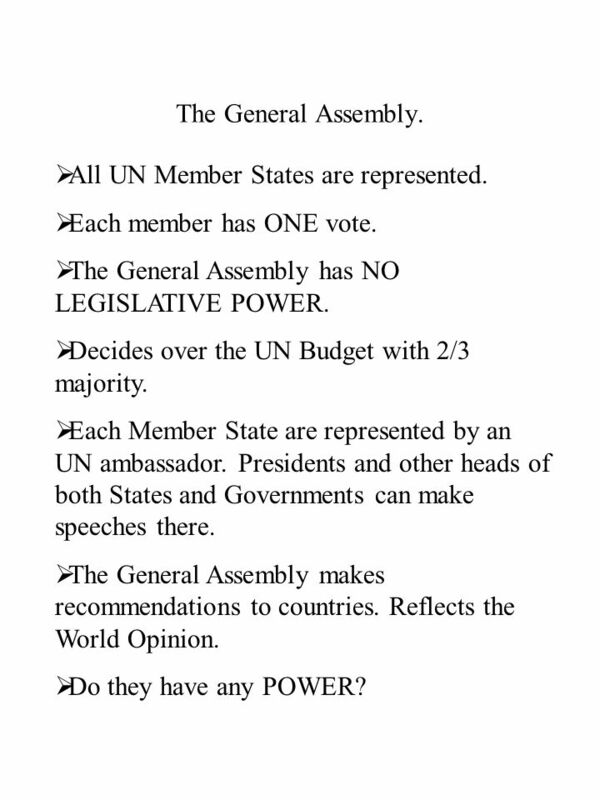 The General Assembly has NO LEGISLATIVE POWER. Decides over the UN Budget with 2/3 majority. Each Member State are represented by an UN ambassador. Presidents and other heads of both States and Governments can make speeches there. The General Assembly makes recommendations to countries. Reflects the World Opinion. Do they have any POWER? 4 Cont. The Security Council. The Permanent Members have a VETO. 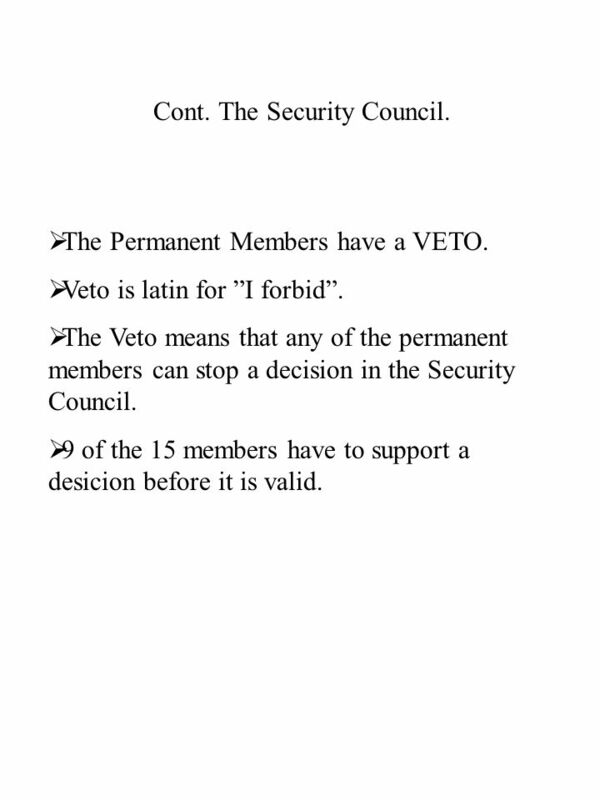 Veto is latin for I forbid. The Veto means that any of the permanent members can stop a decision in the Security Council. 9 of the 15 members have to support a desicion before it is valid. 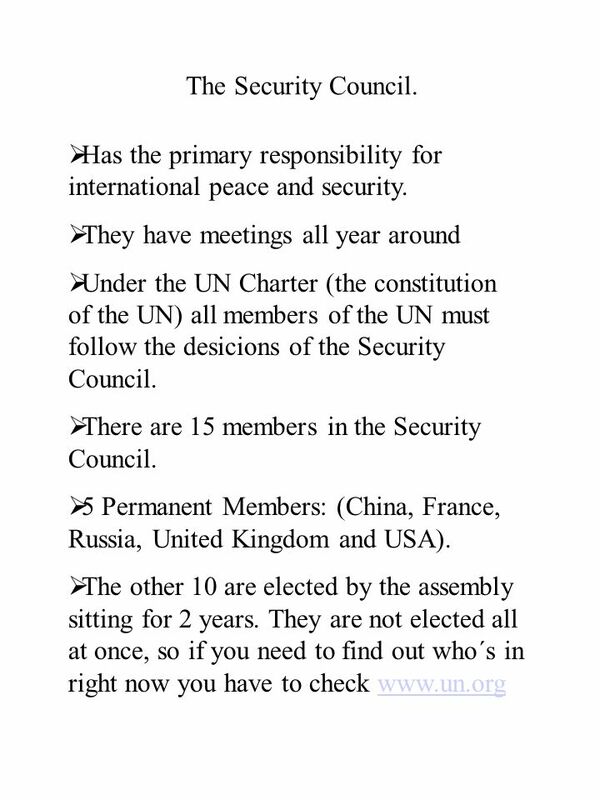 5 The Power of the Security Council. They have the power to: Investigate any dispute or situation which might lead to international friction. Recommend to the states how to solve the conflicts. Decide whether a state has committed a hostile act against another state, and decide on actions against such aggressor. 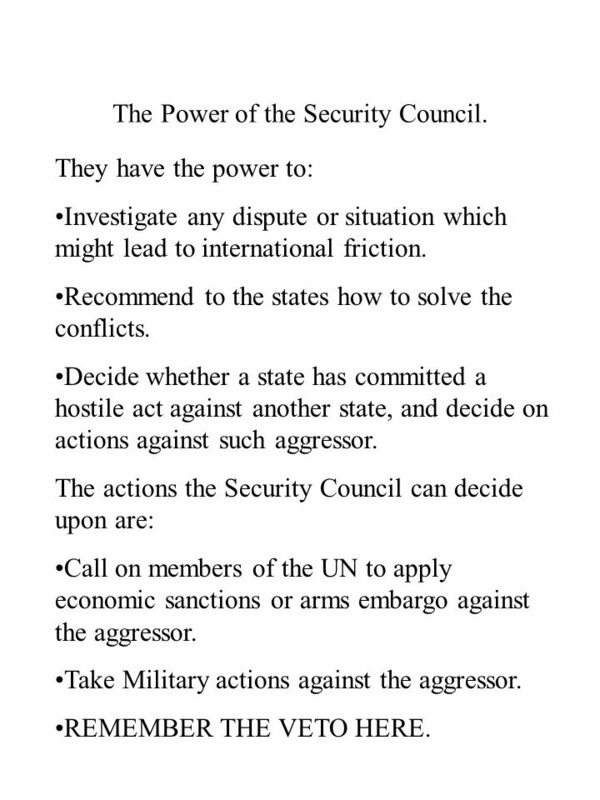 The actions the Security Council can decide upon are: Call on members of the UN to apply economic sanctions or arms embargo against the aggressor. Take Military actions against the aggressor. REMEMBER THE VETO HERE. 6 The Economic and Social Council. Works under the General Assembly. NOT like the Security Council. Their task is to COORDINATE all economic and social AID within the UN. They are the central forum for formulating policy recommendations to the members. They have a lot of contacts with NGOs. 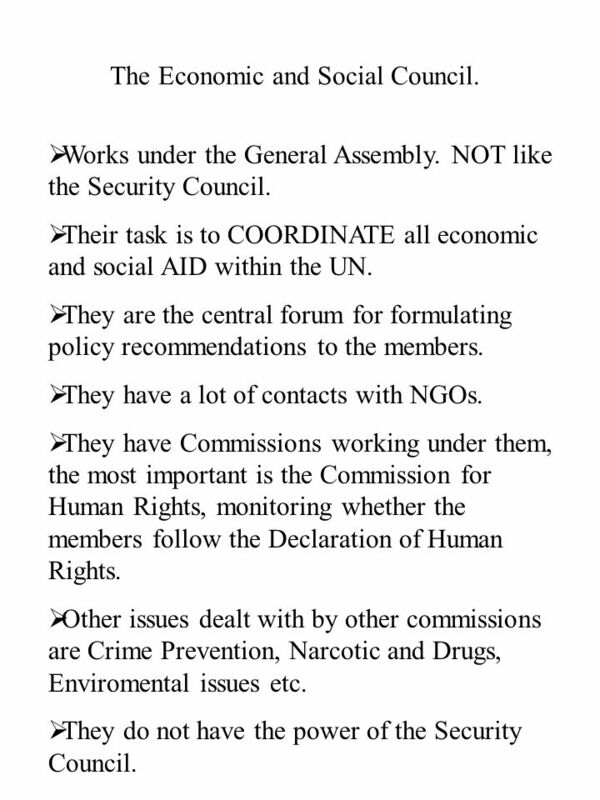 They have Commissions working under them, the most important is the Commission for Human Rights, monitoring whether the members follow the Declaration of Human Rights. Other issues dealt with by other commissions are Crime Prevention, Narcotic and Drugs, Enviromental issues etc. They do not have the power of the Security Council. 7 The Trusteeship Council. The International Court of Justice. The Trusteeship: Has no role right now. Used to adminstrate the territories put under UN governing historicaly. All of these areas are now Independent States. In the future they mght be ones to govern a future Iraq, Palestine etc. 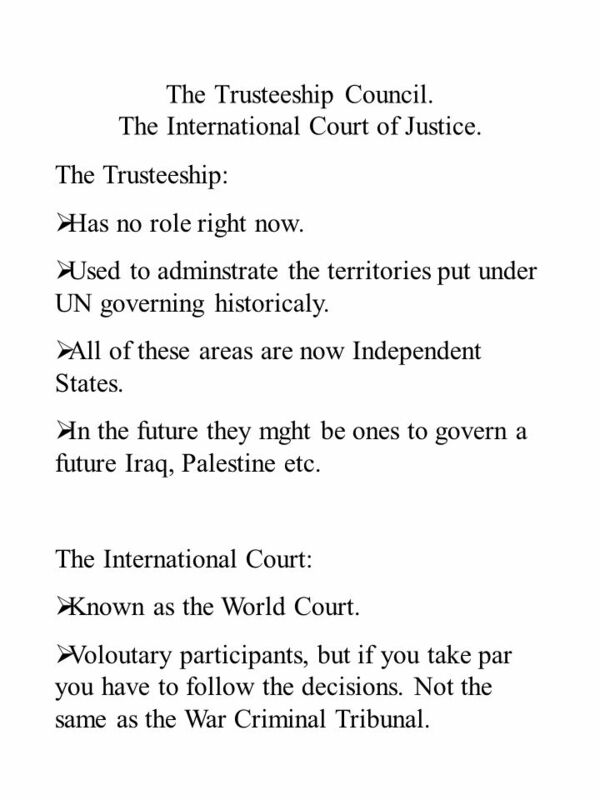 The International Court: Known as the World Court. Voloutary participants, but if you take par you have to follow the decisions. Not the same as the War Criminal Tribunal. 8 The Secretariat. Has a staff of 7500 persons. Is headed by the Secretary-General mr Ban Ki-Moon Carry out the administrative work of the UN. 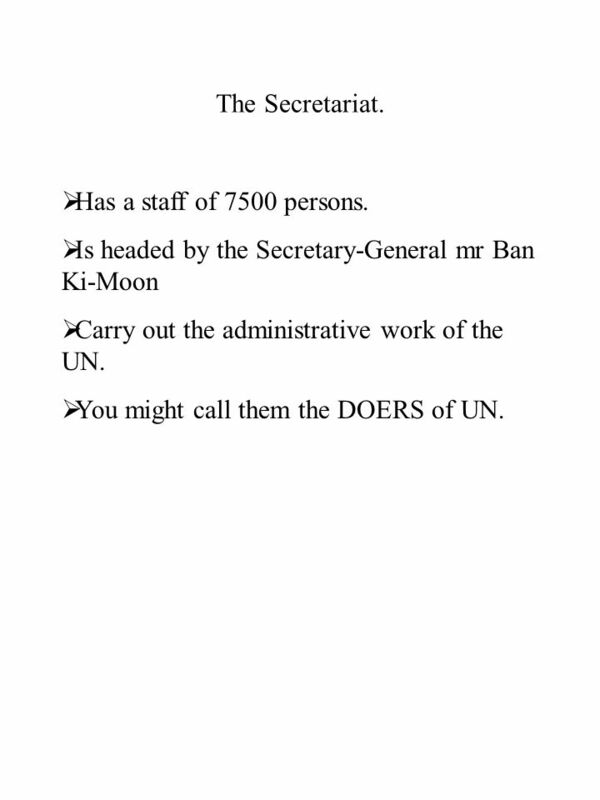 You might call them the DOERS of UN. 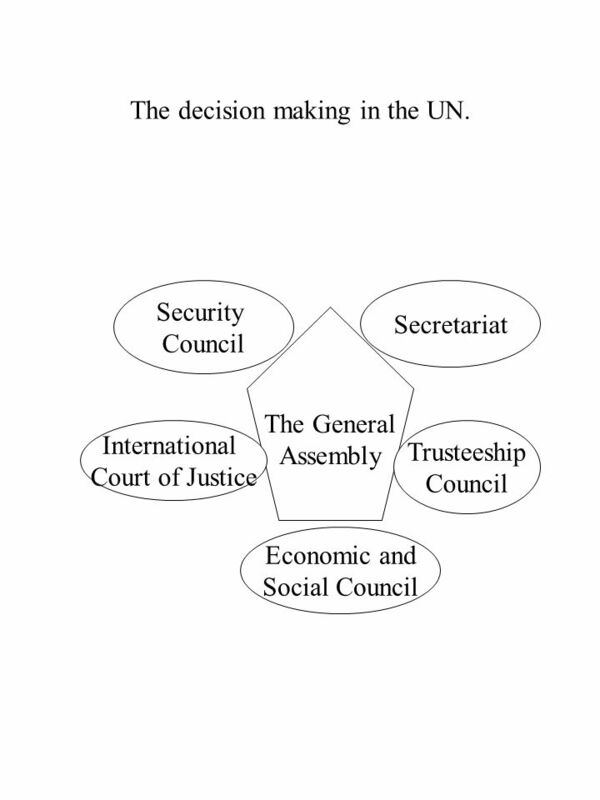 Download ppt "The decision making in the UN. The General Assembly Security Council International Court of Justice Economic and Social Council Secretariat Trusteeship." SGTM 1 A: Peacekeepers’ Introduction to the United Nations System Slide 1 SGTM 1 A: Peacekeepers’ Introduction to the United Nations System. CzieglerSS2031.  The United Nations began in 1945 after WWII. It consisted of 51 countries, who were “committed to maintaining international peace and. Where the fun never starts!!! Model United Nations The institutions and organs of the UN Overview and positioning of the Economic and Social Council (ECOSOC) 1.